Learn Chess Rules in Minutes! You'll be an expert on chess rules in less than an hour. Even if you don't know the first thing about chess. You'll be ready to wade into battle in no time. Developing good, sound strategy may take a while, but the rules are a snap. The game of chess is played between two opponents on a square board called a chess board. The object of the game is to capture the opposing King. The player with the white pieces starts the game. Play then alternates with each player taking turns to move. If you're not clear on anything when you've finished reading these rules you should visit the FAQ. For an intro or a refresher on chess terminology take a look at the chess glossary. You can find any page very quickly in the Sitemap. The chess board is composed of 64 equal squares, alternately light and dark squares. This has been the case since the middle ages. 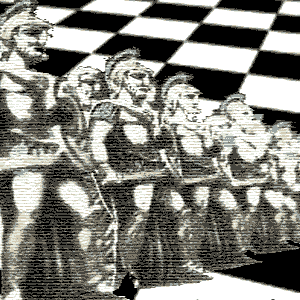 The chess board is placed in such a way that the corner square to the right of each player is white. The eight rows of squares running from one player to the other player are called files. The eight rows of squares running at right angles to the files are called ranks. The strips of squares of the same color, touching corner to corner, are called diagonals. The diagram on the left shows the initial set-up to start a game. Both players start with 16 pieces. Some people do not regard the pawns as pieces. A King, Queen, 2 Rooks, 2 Knights, 2 Bishops and 8 pawns. White Rooks: a1,h1; Black Rooks: a8,h8; White Knights: b1,g1; Black Knights: b8,g8; White Bishops: c1,f1; Black Bishops: c8,f8; White Queen: d1; Black Queen: d8; White King: e1; Black King: e8. 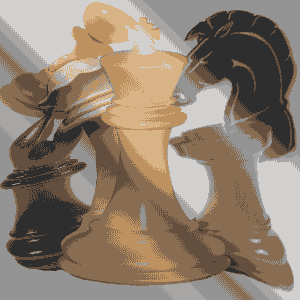 White pawns: a2,b2,c2,d2,e2,f2,g2,h2; Black pawns: a7,b7,c7,d7,e7,f7,g7,h7. Apart from castling, you make moves by moving one of your pieces from one square to another square. The destination square on a given move must be either vacant or occupied by one of your opponent's pieces. Only the Knight may cross a square occupied by another piece. The only possible exception to this rule is the special castling move between King and Rook. You capture an enemy piece by moving one of your pieces to a square occupied by your opponent's piece. On capturing, you immediately remove your opponent's piece from the chess board. The various pieces have their own unique movements. For a crash course on the main rules you can take a look at the chess basics. The pawn moves only forward to the other end of the board. The Knight moves in an L-shaped fashion. You may also find the Knight Tour interesting. The Bishop's move gives it maximum range on the diagonals. The Rook's move gives it maximum range on the straights. The Queen's move gives her maximum range on the files, ranks or diagonals on which she stands. The King moves just like the Queen except instead of enjoying maximum range he is restricted to minimum range. He can move only one square at a time in any direction. 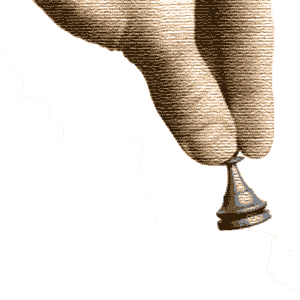 4. a promotion of a pawn, when the pawn has been removed from the board and your hand has released the new Queen. So long as you first advise your opponent, and only on your turn, you may adjust one or more pieces on their squares. When is a Position Illegal? 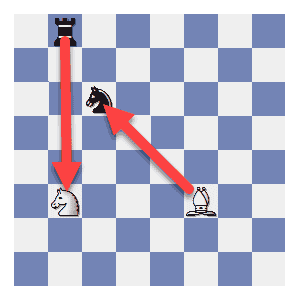 It is illegal to leave your King in check at the end of your move. You must avert the threat if at all possible. If, during a game, it is discovered that an illegal move was made, the game shall be reverted to the position it was before the illegal move was made. If the position cannot be reinstated, the game shall be annulled and a new game played. When a player threatens the opposing King with capture, the King is said to be in check. 3. Block the check by moving one of your pieces between the attacking piece and your King. 4. Your opponent refuses to comply with the chess rules during the game. 1. If your King, on your turn to move, is not in check and you cannot make any legal move. Your King is then said to be "stalemated." 2. If agreed between the two players. 3. If you claim that the same position (a) is about to appear or (b) has appeared, for the third time, the same player having the move each time. 2. who is about to reply to a move that has produced the repeated position. If you move without claiming a draw in the manner described in 1. or 2. you lose the right to claim a draw. This right is restored to you, however, if the same position appears again, you again having the move. If pieces of the same kind and of the same color occupy the same squares, but the possibilities for moving these pieces are not the same, then the player moving cannot claim a draw. You may draw if you show while moving that at least fifty consecutive moves have been made by each side with no capture of any piece or the movement of any pawn. 4. You refuse to comply with the chess rules during the game. If both players refuse to comply with the rules or if both players are more than an hour late, both players lose. Well done, you've just worked your way through a comprehensive run-down of the official rules of chess. Give yourself a well deserved clap on the back! 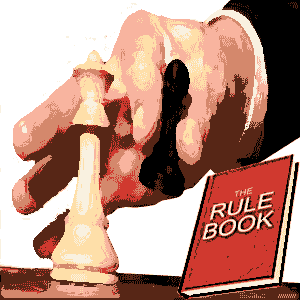 For further reading on Over the Board rules, check out FIDE Rules and USCF Rules. When you break them down, it's not that hard really. Hopefully you will found this run-down well explained. If not ask me a question on the FAQ section. If you're satisfied that you have a handle on the rules and you feel you've got the moves down, you are ready to dig into strategy.